When we take a long journey, it often helps to get detailed, reliable instructions from someone who knows the way. Yes, knowing the general direction to go can be very helpful; and it's always good to have a broad overview. But we often face complex situations along the way where we need to take just the right turn at just the right time. So, it helps to have detailed directions as well. Well, something like this is true for followers of Christ. We are on one of the greatest journeys imaginable, and it is a journey that will end with the coming of God's kingdom to earth as it is in heaven. Now it's good to have this ultimate destiny in mind; it helps to know the big picture. But traveling this Christian road can be so complex at times that we need more than broad concepts and general principles; we also need authoritative, detailed instructions. And God has given us these kinds of directions in the canon of the Old Testament. 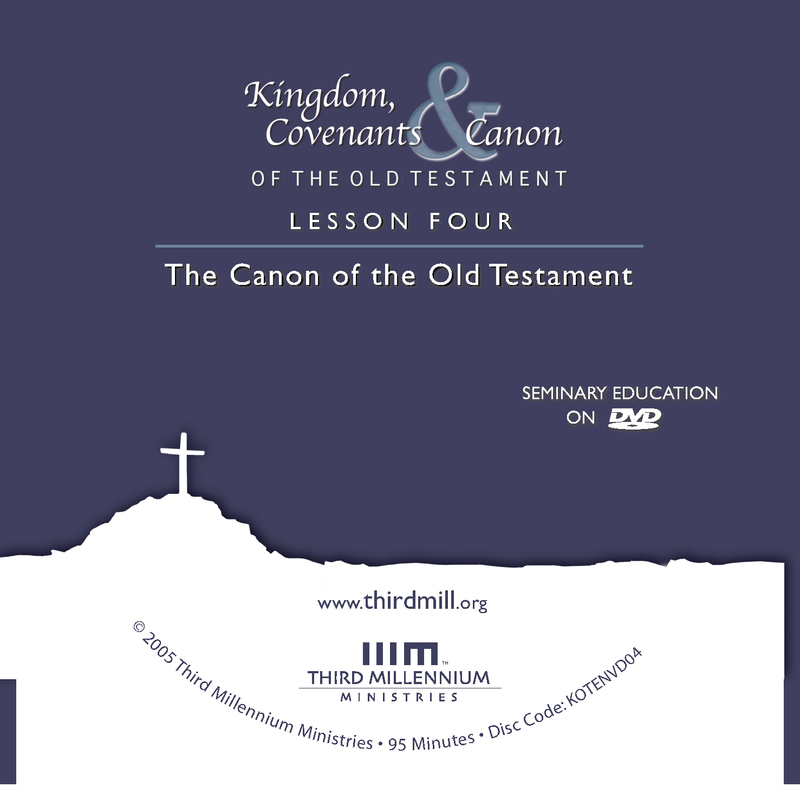 This is the fourth lesson in our survey of the Old Testament called Kingdom, Covenants and Canon of the Old Testament . In earlier lessons, we have seen that the Old Testament is a book about God's kingdom and that God administers his kingdom through covenants. But we have entitled this lesson "The Old Testament Canon." The Old Testament is our "canon," an older word meaning our "standard" or "measure", and this canon provides God's people with authoritative, detailed instructions as they live in covenant with God and seek his kingdom. In this lesson, we will explore how the Old Testament canon presents rather specific guidance and how we may find it. As we will see, there are three main ways that the teaching of the Old Testament comes to the people of God, and we will describe these ways in terms of three metaphors: first, we will see how the Old Testament functions for us as a mirror, reflecting authoritatively on questions and themes that rise primarily out of our concerns; second, we will speak of the Old Testament as our window to history, seeing how it provides authoritative records of significant events in the past that guide God's people as they serve him; and third, we will look at the Old Testament canon as a picture, as a series of literary portraits designed by their human authors to influence the people of God in particular ways in the past and to be applied throughout the ages. Now, the differences in these approaches amount largely to matters of emphasis, but for the sake of our study we will look at them separately. Let's begin by looking at the ways the Old Testament canon is like a mirror, reflecting on questions and interests that we bring to reading it. Have you ever noticed that when you read a book with a group of friends, some things grab your attention and other things grab the attention of others? If you ask the group, "What is the most important thing you read in this chapter?" you'll often get very different answers from different people. Now, many times it isn't that one person is right and the others are wrong; rather, people focus on different aspects of what they read, because they all notice things that are particularly important to them. When we read books, we often treat them as mirrors, seeing ourselves as the books reflect our interests and concerns. Men find things that concern them; women often find other things more interesting. Old and young, this person and that person — to one degree or another, we all respond to what we read by focusing on what matters most to us. In much the same way, faithful Christians often approach the Old Testament as if it were a mirror reflecting their interests. We look for what the Old Testament has to say about our concerns and our questions, even if those themes and topics are secondary or minor aspects of the biblical passages that we are reading. We will call this approach to the Old Testament canon "thematic analysis" because it emphasizes themes or topics that are important to us. To explore thematic analysis of the Old Testament, we will touch on two issues: first, the basis of thematic analysis; and second, the focus of thematic analysis. Let's look first at the basis of exploring the Old Testament with thematic analysis. What justification is there for this approach? There are at least two ways to see that thematic analysis is an appropriate tool for discovering the authoritative instructions of the Old Testament canon. First, the very character of Scripture encourages us to read it this way; and second, we have examples of biblical writers and characters using thematic analysis. Consider first how the character of Scripture validates thematic analysis. Thematic analysis is an appropriate way to read the Old Testament, because like most well written texts of significant length, Old Testament passages touch on many different topics. They have implications for more than one issue at a time. Unfortunately, many well-meaning Christians often think of the meaning of Old Testament passages in far too simplistic terms. They act as if biblical passages presented a very thin laser beam of information. One passage means this and another means that. These believers often focus exclusively on the main or prominent themes of a passage and disregard the minor themes that the passage also touches. But careful interpretation helps us to see that the meaning of Old Testament passages actually is much more complex. Rather than being like a laser beam, meaning compares more closely to a gradually diffused beam of light. In the first place, some themes are quite important; the passage shines brightly on them. We may call these the prominent themes of a passage. In the second place, other topics are touched in a more peripheral manner, as if illumined by weaker levels of light. We may call these the minor themes of a passage. And in the third place, we should add that some topics or themes are so far removed from the concerns of a passage that we may say that, for all practical purposes, these passages shed next to no light on them. We may call these extraneous themes. Thematic analysis recognizes this range of themes and often draws attention to the array of secondary or minor topics that Old Testament passages address. When they are interesting to us, these minor topics become the primary objects of study for thematic analysis. Now, if we were to ask ourselves, "What does this verse teach?" at first glance we might think that the answer is very simple — Genesis 1:1 tells us that "God created the world." Most of us would probably agree that this is a fair way to summarize the main idea of this verse. But as true as this summary may be, if we restrict ourselves to this central topic, we ignore many other themes this verse touches. Just how many themes or motifs appear in these words? Actually, the list is very long. Besides speaking of the fact that God created the world, this verse touches on theological themes like there is a God, and God existed before creation. It also tells us that God is powerful enough to create, and that God should be acknowledged as the Creator. Genesis 1:1 also touches on a number of matters that focus more on the creation. It tells us the fact that there was a creation event, that creation is not self-sufficient, that heaven is a dimension of creation and that the earth is a dimension of creation. Because this one verse touches on all these minor themes, we can legitimately focus on any of them. Now, if so many themes appear in just one verse like Genesis 1:1, imagine how many themes appear in larger passages. Most Old Testament passages speak of so many topics that they can have countless connections with the many interests and questions that we bring to them. So long as we are careful to distinguish prominent and minor themes from extraneous topics, it is quite appropriate to use thematic analysis to discern the Old Testament's authoritative detailed instruction. Gideon, Barak, Samson, Jephthah, David, Samuel and the prophets, who through faith conquered kingdoms, administered justice, and gained what was promised; who shut the mouths of lions, quenched the fury of the flames, and escaped the edge of the sword; whose weakness was turned to strength; and who became powerful in battle and routed foreign armies (Hebrews 11:32-34). Now, anyone familiar with the stories of Jephthah and Samson in the book of Judges knows that Judges did not present these two men in a very favorable light. The prominent themes in the book of Judges consist almost exclusively of the personal and moral failures of Israel's leaders during this period of history, including Jephthah and Samson. In fact, as we will see in later lessons, these failures were highlighted to prove that the judges were not capable of leading the people of God. Nevertheless, as relatively minor themes, the book of Judges does mention that both Jephthah and Samson achieved some victories over God's enemies when they turned to God in faith. Because of this, the writer of Hebrews was able to highlight the positive accomplishments of these men as he looked for answers to his own questions. Even though he was applying a thematic approach to the book of Judges, stressing themes that were important to him, the writer of Hebrews was remaining faithful to the text of Judges and was submitting himself to the Old Testament canon. Now that we have seen that thematic approaches to the Old Testament's authoritative message are legitimate, we should turn our attention to the main concerns or the focus of thematic analysis. Because the themes that interest us vary so much from person to person, time to time, and place to place, we should not be surprised to find that there are many different thematic approaches to the Old Testament. At the same time, we can identify certain trends that Christians follow as they look for answers to their questions. We will speak first of a focus on doctrines; second, of an emphasis on examples; and third, of attention to personal needs. Perhaps the most influential way the Old Testament has been approached through thematic analysis has been for the support of Christian doctrines. For millennia, the Old Testament has been viewed as a source of theological truths that theologians may arrange into doctrines. One very fruitful way of thematic analysis is to ask questions that derive from the traditional categories of systematic theology. For example, we may ask, "What does this passage say about the character of God? What does it say about the condition of humanity? What does it say about the doctrine of judgment and salvation?" These kinds of concerns are legitimate questions to raise with nearly every passage in the Old Testament because they are widely addressed in the Scriptures. But we should always be aware of the fact that they are not always the main concerns of particular passages we may be reading. They often rise out of our own interests prompted by our study of traditional theology. This kind of thematic focus often takes the form of proof-texts, quick references to specific Old Testament passages to justify doctrinal positions. Nearly every time we read a book on systematic theology, a confession of faith, or an official doctrinal statement, we find a number of Old Testament references that are mentioned to support doctrinal positions. Unfortunately, sometimes the doctrines that proof-texts are supposed to support are actually extraneous to the verses cited. When the verses in view have practically nothing to do with the doctrine they are used to support, the doctrinal position can appear careless or even dishonest. In fact, some theologians have so grossly mishandled Old Testament texts in this way that others have rejected the process of proof-texting altogether. But to abandon proof-texting because of abuses is not the path of wisdom. Well-established proof-texts are usually valid and helpful ways of referring to themes in biblical passages, even when these themes are not central to the passages. Another common form of thematic analysis is a concern for examples. Often, we look to the Old Testament for characters whom we should imitate or reject. Unfortunately, some Christians have abused this approach to the Old Testament by mishandling the thoughts, words and actions of biblical characters. Because they do not keep the broader teaching of Scripture in mind, it is often the case that Christians exalt some Old Testament characters as models when, in fact, the characters are not so exemplary. This kind of abuse has been so widespread that many scholars have also rejected this type of thematic analysis. But despite its abuses, the thematic concern for examples can be very valuable. For example, consider the well-known story of David and Goliath in 1 Samuel 17. Time and again preachers have appealed to David as an example. We frequently hear David extolled for refusing Saul's armor, for trusting in the power of God, and defeating Goliath. His attitudes, words and actions are treated as models of the ways we need to have faith in God and receive victory from him as well. Sadly, in recent decades a number of interpreters have insisted that treating David as an example of faith in this passage completely misses the point. Now, it is true that the prominent theme of this story is that God raised David to replace Saul as Israel's king. But that in no way implies that this is the only theme of this passage. David's faith was his way to victory; it is a critical detail of this story because it explains one of the reasons that God established David and his dynasty. So it is right to notice David's faith as a minor theme in this passage, and it is right to follow his example. The fact is that the Old Testament is full of examples to be imitated or rejected. And searching for these examples is a legitimate way to find the authoritative, detailed teaching of the Old Testament. In the third place, it is quite legitimate for Christians to use thematic analysis of the Old Testament to gain guidance in other sorts of more personal concerns, such as answers to questions that come from our personal struggles and needs. We have all heard sermons from the Old Testament on subjects like these — how to be a good father or mother, how to be successful at work, how to worship God, how to deal with personal and emotional struggles. Old Testament passages are often rightly viewed through thematic analysis as a way of addressing these kinds of practical concerns. For instance, ministers often analyze David's failures as a father. They derive principles from Jacob's fourteen years of labor for his wife. Pastors turn to the story of Melchizedek and Abraham to illustrate elements of Sunday morning worship. They look at Elijah's emotional struggles after Mt. Carmel for the signs of spiritual depression. Thematic analysis — treating the Old Testament as a mirror — is of such value that we must never ignore it. As we seek to discover the detailed authoritative teaching of the Old Testament canon, it is right for our attention to be drawn toward every theme that God presents, even the minor ones. Now that we have seen that we may discern the authoritative, detailed teachings of the Old Testament canon by approaching it as a mirror through thematic analysis, we are in a position to turn to our second topic: approaching the Old Testament canon as a window to history. When we read a book that concerns events from the past, it is only natural for our attention to move toward those historical events it describes. Sometimes we are so engrossed in the history that we stop thinking about issues in our own lives and we even ignore many aspects of the book itself, such as its style and its artistic presentation. Instead, we look through the book as if it were a window to the past, imagining how things must have been in the days it describes. In a similar way, the Old Testament canon describes a world that existed long ago. And one of the ways Christians have submitted to the Old Testament's authority has been to use it as a window to discover events from the past, the history of salvation recorded in the Bible. Because of its focus on history, we will call this approach to the Old Testament canon historical analysis. In this approach, we learn about past events, ponder their significance, and apply the lessons of that history to our lives. To one degree or another, faithful Christians have always treated the Old Testament as a window to history. Even in the early church, when thematic analysis was dominant, the historical nature of the Old Testament was not ignored. But in the last four hundred years, especially in the last one hundred years, it has become clear that one of the most central features of the Old Testament canon is that it presents the history of God's dealings with his people, and as a result, in our day, we find many Christians approaching the Old Testament canon with historical analysis, focusing their attention on the history to which the Old Testament refers. To explore the historical analysis of the Old Testament canon, we will look at two issues: first, the basis or justification of historical analysis; and second, the focus of historical analysis. Let's look first at the basis upon which we may legitimately approach the Old Testament as a window to history. There are countless ways to justify historical analysis of the Old Testament, but we will have to limit our discussion to just two considerations. On the one hand, the character of Scripture itself encourages us to treat the Old Testament as a window to history, and on the other hand, biblical examples make it clear that we may rightly approach the Old Testament with historical analysis. Let's think first about the ways the character of Scripture provides a solid basis for historical analysis. In these lessons, we will build our study of the Old Testament on the conviction that the divine origins of Scripture, the fact that they are God-breathed, means that when the Old Testament claims that something is true, then it is true. We can put the matter this way — the Old Testament makes many claims about what happened in history. When we consider these claims and their relationship with actual historical facts, as followers of Christ we affirm that every historical claim the Scriptures make corresponds to actual historical events. When the Old Testament teaches that something happened, it speaks with the authority of God himself, so we can be sure that it happened. Nevertheless, everyone familiar with the Old Testament knows that the correspondence between the Old Testament and actual history must be qualified. If it is true that the world cannot contain the books required to report everything about just one man's life, we should realize that the Old Testament only reports a tiny portion of the innumerable events that took place in the millennia that it describes. In the second place, we have to admit that there have been many objections to the historical reliability of the Old Testament. Not everyone has accepted the correspondence between the historical claims of the Old Testament and the facts of history. Sometimes, the correspondence between Scripture and history is questioned simply out of disbelief. After all, the Old Testament canon is no secular history; God and supernatural powers play major roles in the Old Testament outlook on history. So, unbelievers often find it difficult to believe that the Old Testament corresponds to real history. By contrast, of course, followers of Christ should have no problem believing in the supernatural world that the Old Testament describes. But at the same time, some objections to the Old Testament's historical reliability even challenge believers because they come from the evidences raised by scholars. Many respected archaeologists, geologists, and other scientists have pointed to data that they believe disproves the historical reliability of the Old Testament. Geologists raise questions about the creation account and the worldwide flood in Noah's day. Archaeologists question the date and the nature of the conquest of the Promised Land, as well as the dates of kings of Israel and Judah, and the outcomes of wars and other events mentioned in the Old Testament. Unfortunately, these scientific arguments sometimes persuade even Christians to deny the historical reliability of the Old Testament. In fact, today we often hear well-meaning theologians affirm that only a few of the major events in the Old Testament actually took place as reported. Sometimes they speak of the history of the Old Testament not as actual events in space and time, but as "salvation history" or "redemptive history," merely what primitive Israelites believed had happened, and things that sophisticated modern people know could not have happened. As far as these theologians are concerned, the Old Testament is fully reliable only in its theological and moral principles. But of course, the theology and moral teachings of the Old Testament are inextricably tied to its historical claims. To remove historical reliability from the Old Testament is to destroy theological and moral reliability as well. Now, in addition to these qualifications, we should also admit that the correspondence between the Old Testament and history is not always easy to see. Why is this so? What kinds of things obscure the historical reliability of the Old Testament? There are at least three reasons why the Old Testament sometimes seems to be in tension with other sources of historical information. First, sometimes scientists misunderstand the evidence supporting their claims. As much as we should value archaeology and other sciences, it should be obvious that scientists make mistakes. Their conclusions are always subject to correction by further evidence. For example, two hundred years ago, many expert scholars insisted that the Old Testament was in error when it referred to the Hittite people. But in the last century archaeologists discovered the Hittite culture. In fact, the many writings from the Hittites have provided very fruitful insights into Old Testament studies. In much the same way, a century ago it was a settled scholarly opinion that the Old Testament's date for the exodus and conquest around 1400 BC was much too early. In recent years, however, the archaeological data has been evaluated again, and strong arguments have been put forth even by unbelievers in favor of the biblical portrait. These and countless other examples demonstrate that when the Old Testament does not correspond to scientific opinion, the scientists may simply be wrong. So the sun stood still, and the moon stopped… The sun stopped in the middle of the sky and delayed going down about a full day (Joshua 10:13). For centuries, the church had taken this verse to teach that the sun literally stopped revolving around the earth for a time and they ruled out the possibility of a solar system. Today, however, scientific investigation has established with much certainty that day and night are caused by the earth spinning on its axis. As a result, most modern Christians understand Joshua 10:13 differently from their historical predecessors. We know that daylight was miraculously extended for Joshua, but we also know that the halting of the sun was only an appearance of things relative to Joshua's position on the earth. We may now take this verse and others like it as ordinary, phenomenological language, akin to the way we still speak in the modern world of "sunrise" and "sunset." The strength of scientific evidence for the solar system has not caused us to reject the historical reliability of the Old Testament. Rather, it has helped us correct our interpretation of the Old Testament. Third, sometimes both scientific opinion and our interpretation of the Old Testament are in error. Because we know that both scientists and biblical interpreters are prone to error, we must be open to the possibility that further research will demonstrate that both sides of the controversy are mistaken. Careful work both in science and with the Old Testament may one day demonstrate that the Old Testament actually does correspond to historical fact. Now, we must always keep in mind that some apparent discrepancies between actual history and the Old Testament may never be solved. Human sin and limitations often make final resolutions unattainable. Every discipline of study will continue to present new challenges to our trust in the historical reliability of the Old Testament, and we should not expect to resolve them all. There are countless disagreements among competent scientists that seem to have no resolution, and the same is true in the interpretation of the Old Testament. We may often gain a degree of understanding, and even offer some possible solutions, but still not come to the point that all questions are eliminated. No matter what tensions arise between the Old Testament and scientists, faithful followers of Christ must conclude that the inspiration of Scripture establishes the historical authority of the Old Testament, and as a result of this belief in the historical reliability of Scripture, we can rightly and thoughtfully approach the Old Testament as an authoritative window to history. Now that we have seen how historical analysis of the Old Testament is supported by the character of Scripture, we should turn to a second foundation for this outlook — biblical examples. In all of the Old Testament and New Testament Scriptures, there is not one instance of the biblical writers questioning the historical veracity of the Old Testament. We will mention just two telling passages by way of illustration. Adam, Seth, Enosh, Kenan, Mahalalel, Jared, Enoch, Methuselah, Lamech, Noah. The sons of Noah: Shem, Ham and Japheth (1 Chronicles 1:1-4). For modern Christians, the Chronicler did something remarkable here. He turned to the first five chapters of Genesis and treated them as historically reliable. He mentioned thirteen men from the opening chapters of Genesis. Most modern people consider the biblical record of these men to be legendary or fictional. But the Chronicler demonstrated a full trust in the historical reliability of the early chapters of Genesis. He used Genesis, as he did many other books in the Old Testament, as an authoritative window to history. In a similar way, consider the example of Luke's record of Stephen's speech in Acts 7. Using various portions of the Old Testament, Stephen spoke of Abraham, Isaac, Jacob, Joseph, Moses, Aaron, Joshua, David and Solomon as historical figures, and he affirmed that the stories about them recorded in the Old Testament were factual. As far as Stephen was concerned, the history reported in the Old Testament was true, and that historical record served as a basis for calling his fellow Jews to repentance and faith in Christ. Time and again biblical writers and characters demonstrated their belief in the correspondence between the Old Testament's historical claims and actual historical facts. They looked at the Old Testament as a window to history and drew theological conclusions for their own day from that history, and following their examples we must do the same today. Now that we have seen that there is a legitimate basis for approaching the Old Testament canon as an authoritative window to history, we should turn our attention to a second issue — what is the focus of historical analysis? What is the goal of this approach to the Old Testament canon? In the last century, one form of historical analysis has grown in popularity under the title "biblical theology." Now, this is a fairly broad term that refers these days to several different approaches to the Scriptures. But one of the most influential forms of biblical theology can be described as focusing on two basic steps: first, creating a "synchronic snapshot," looking at a period of time in the Old Testament as a unit; and second, performing a "diachronic trace," looking at the connections between events through time. Of course, these two steps are inter-related and work together in countless ways. Biblical theologians constantly go back and forth between them. But for our purposes it will help to look at each of them separately. Let's look first at the process of creating a synchronic snapshot. In the synchronic step, biblical theologians divide the Old Testament into periods of time and explore what the Scriptures tell us about those periods. They focus on a segment of biblical history and summarize the complex network of events that occurred at that time, treating them as a synchronized unit, a slice of time. Following the theological focus of the Old Testament, they usually concentrate on the ways these events characterize God's interactions with his people. As a result, a synchronized snapshot is created for each epoch of the Old Testament. Now we need to be careful here. As we have seen in an earlier lesson, Old Testament history flows continuously, like a river flows toward the sea. Its history is developmentally unified, not dividing into distinct segments but moving forward in a continuum toward greater developments of the kingdom of God. So, dividing the Old Testament into periods is always somewhat artificial. It is like dividing the length of a river into distinct segments. Just as a river can be divided at different points along the way with different benefits, there are many beneficial ways to divide Old Testament history to create synchronic snapshots of the Old Testament. In fact, the criteria we use to divide the Old Testament into ages heavily influence the divisions we create. For instance, in earlier lessons in this series, when we had in mind the developments of God's kingdom on earth, we spoke in terms of the primeval period, and the period of Israel's national history. And of course, we added the New Testament period to these Old Testament divisions. These divisions brought to light the major steps of God's kingdom plan. When we focused in another lesson on covenants, we spoke of the age of the universal covenants and the age of the covenants with Israel. And we added the New Covenant for the New Testament. Then we sub-divided the universal covenants into the times of Adam — the covenant of foundations, and Noah — the covenant of stability. And we sub-divided the period of national covenants into the times of Abraham — the covenant of promise, Moses — the covenant of law, and David — the covenant of kingship. And as always, we then added the new covenant in Christ — the covenant of fulfillment). These divisions helped us see how God used covenants to administer his kingdom. Another way of separating the Old Testament into synchronized periods appears in the seventh chapter of the Westminster Confession of Faith . Following the criteria of major changes in God's dealings with humanity before and after the fall into sin, the Confession of Faith divides Old Testament history into the time of the "covenant of works" before Adam sinned and the "covenant of grace" which covers the rest of biblical history. It then speaks of an important division in the covenant of Grace between the period called "under the law," meaning the time of the Old Testament, and the period called "under the gospel" meaning the New Testament. In the last century, the widely respected biblical theologian Geerhardus Vos divided the Old Testament according to the criteria of major shifts in the form and content of divine revelation. He spoke of the pre-redemptive era before the fall; the first redemptive era following the fall and preceding Adam and Eve's expulsion from the Garden; the period leading from the fall to the flood of Noah's day; the period after the flood leading to the patriarchs; the period of the patriarchs; the period of Moses; and the prophetic period after Moses; and, of course, he spoke of the New Testament as well. Vos followed these divisions because he believed that the major changes that took place in the form and content of divine revelation moved history from one age to the next. Now, once a period of time is identified, the job of the biblical theologian is to focus on the network of historical events that revealed God and his will in that period. Of course, in every historical period all the events that took place were interrelated. But in a given period, some events have much larger formative roles than others. Biblical theologians typically focus on the more formative or central events of each period in the Old Testament. For example, biblical theologians may focus on the slice of Old Testament history often known as the period of promise, the time of Israel's patriarchs, Abraham, Isaac and Jacob. They often observe that God revealed himself in this time primarily through direct speech, visions and dreams. They note that there was a narrowing of the ethnic focus to the descendants of Abraham, Isaac and Jacob. They see that the patriarchs performed worship at many altars. They describe the promise of many descendants given to the patriarchs, and they notice the importance of the promise of land to the fathers. These kinds of observations are attempts to characterize the patriarchal period as a whole, identifying formative events that play major roles throughout that timeframe. Biblical theologians may also choose to focus on the period of law, the time of Moses who led Israel through the exodus and toward the conquest of the Promised Land. In these times, God revealed himself in a variety of ways, but primarily through the law of Moses. The narrowed ethnic focus on Israel grew into a national focus. The tabernacle was constructed and worship was centralized there. Israel had grown to large numbers, and God led Israel to possess the Promised Land. These kinds of events characterized the period of Moses as a whole and give us a snapshot of this moment in biblical history. In addition to synchronic snapshots of particular periods in biblical history, theologically-oriented historical analysis usually moves to a second step, a diachronic trace. The term "diachronic" simply means "through time." So, the diachronic trace focuses on the ways biblical events connect with each through time, from one period to another. We can summarize the process of establishing a diachronic trace in this way: As the formative events of each period are identified, it becomes apparent that closely associated events happen in each age. These events may be associated with each other for different reasons, but biblical theologians take note of these associations and trace how the resulting series of events reflect developments from one period of history to the other. Comparisons of events in each age often reveal vectors, directions or paths which the Old Testament followed. They give insights into the progress of God's kingdom. As we have seen elsewhere, at this time God promised Abraham the land of Canaan for his descendants, and this event is very central to the entire network of formative events in the period of the patriarchs. But understanding the event of God's promise of the land in the patriarchal period alone is not good enough. Biblical theologians also want to know, "What past events form the background to this promise of possessing the land of Canaan? And how do future events unfold its significance?" So, they move to a diachronic approach to increase their understanding of this event. God blessed them and said to them, "Be fruitful and increase in number; fill the earth and subdue it. Rule over the fish of the sea and the birds of the air and over every living creature that moves on the ground" (Genesis 1:28). Cursed is the ground because of you; through painful toil you will eat of it all the days of your life. It will produce thorns and thistles for you, and you will eat the plants of the field. By the sweat of your brow you will eat your food until you return to the ground (Genesis 3:17-19). Be fruitful and increase in number and fill the earth (Genesis 9:1). In the primeval record we learn that despite the difficulties caused by sin, God expected redeemed humanity to subdue and have dominion over the earth, just as he had ordained in the very beginning. Knowing this background helps us understand that God's promise of land to the patriarchs was a step forward in the fulfillment of the call to humanity to have dominion. In the primeval times, God called his image to build his kingdom on earth by having dominion in a world of futility and sin. This dominion came to further expression in God calling Abraham and his descendants to take possession of the promised land of Canaan. Through your offspring all nations on earth will be blessed (Genesis 22:18). This verse reminds us that God gave the promised land to Abraham and his descendants as a foothold, a beginning point from which they were to lead all families of the earth toward the blessings of redemption and God-honoring dominion over the entire earth as God originally ordained for humanity. Be strong and courageous, because you will lead these people to inherit the land I swore to their forefathers to give them (Joshua 1:6). The original ordination of humanity to have dominion, and God's promise of land to Abraham were furthered when Israel took possession of the Promised Land. He will rule from sea to sea and from the River to the ends of the earth… All kings will bow down to him and all nations will serve him… All nations will be blessed through him, and they will call him blessed (Psalm 72:8-17). The hope of the period of the empire was that David's house would prove to be faithful to the Lord and that the kingdom would expand bringing redemption and dominion of the faithful over the entire earth. I will shake all nations, and the desired of all nations will come, and I will fill this house with glory… The glory of this present house will be greater than the glory of the former house… And in this place I will grant peace (Haggai 2:7-9). Had Israel been faithful, this victory would have occurred and the blessing of redemption and dominion would have begun to spread throughout the world. But time and again the Israelites who returned to the land rebelled against God, so that the offers of blessing and expansion never materialized. In fact, the restoration was a miserable failure. The call for Adam and Noah to have dominion, the promise to the patriarchs, the establishment of a national homeland in the exodus and conquest, the successes of the monarchical period, and the hopes of the early restoration all collapsed. By the end of the Old Testament, the goal of humanity's dominion over the earth for the spread of God's kingdom was in ruins. To him who overcomes and does my will to the end, I will give authority over the nations (Revelation 2:26). This illustration of historical analysis should make it apparent that historical analysis has much to offer. The Old Testament is God's authoritative record of his dealings with humanity. By looking through the Old Testament to the history behind it, we can find many ways to follow the Old Testament canon as our authoritative, detailed guide. Now that we have seen how the Old Testament gives us guidance both as a mirror through thematic analysis and as a window through historical analysis, we should turn our attention to a third metaphor for the Old Testament, the metaphor of a picture. Perhaps you've been to a museum of fine art, or you've seen photographs of great paintings. It is wonderful to look carefully at a great painting, but it is also a great help to read a bit about the artists and the times when they painted. We can ponder paintings, giving special attention to their artistic qualities. But we can also notice how artists express their outlooks and feelings for others to see by the ways they use color, line, and texture. In much the same way, we may approach the canon of the Old Testament as a picture through a process that we will call literary analysis. In this approach, we treat the Old Testament canon as a collection of literary works, books that were skillfully composed. We learn to appreciate the literary artistry in the Old Testament, but we also seek to understand how Old Testament writers conveyed their outlooks to their original audiences through their efforts. And, as we explore the Old Testament with literary analysis, we will discover even more ways that the Old Testament canon exerts detailed authority over us. Although followers of Christ have always taken the literary qualities of biblical books into account to some degree, it is only in recent years that this approach to the Old Testament has moved to the foreground. In the past, most theologians approached the Old Testament through thematic and historical analysis. But in recent decades, many scholars have emphasized that every attempt at communication, whether in the Bible or not, speaks to much more than the interests of interpreters and the facts of history. By and large, writers carefully construct their documents to express their own outlooks in an attempt to influence the opinions and lives of their readers. The goal of literary analysis is to uncover this intended communicative power of the writers of the Old Testament canon, their power over the people who first received it, and then to apply that same power to our lives today. To explore how the Old Testament may be treated as a picture, we will take the same approach we have taken before. First, we will speak of the basis or justification of using literary analysis on the Old Testament; and second, we will look into the focus of literary analysis. Let's look first at the justification of literary analysis. Why is this approach to the Old Testament valid? The legitimacy of literary analysis can be established in many different ways, but in this lesson we will emphasize two familiar reasons why it is helpful to approach the Old Testament with literary analysis: first, we will see that the character of the Old Testament itself points to the legitimacy of this approach; and second, we will note that examples from biblical writers indicate the importance of this perspective on the Old Testament canon. Consider first how the character of the Old Testament itself indicates the value of a literary approach. In many respects, literary analysis is the approach to the Old Testament that requires the least effort to justify. It is validated by some obvious characteristics of the Old Testament. First, the Old Testament canon comes to us in books or literary units; second, these books display sophisticated literary qualities; and third, the books of the Old Testament represent a great deal of literary variety. Let's think first about the fact that the Old Testament comes to us in the form of books or literary units. At a very basic level, literary analysis is based on the fact that the Old Testament is a collection of literature; it consists of literary units. A quick glance at the table of contents of a modern bible reveals that our Old Testament's contain thirty-nine books. The list is familiar to many of us: Genesis, Exodus, Leviticus, Numbers, Deuteronomy, Joshua, Judges, Ruth, 1 and 2 Samuel, 1 and 2 Kings, 1 and 2 Chronicles, Ezra, Nehemiah, Esther, Job, Psalms, Proverbs, Ecclesiastes, Song of Solomon, Isaiah, Jeremiah, Lamentations, Ezekiel, Daniel, Hosea, Joel, Amos, Obadiah, Jonah, Micah, Nahum, Habakkuk, Zephaniah, Haggai, Zechariah, and Malachi. Now as important as it is to be familiar with this list of books, we should mention several qualifications that should be kept in mind as we approach these books from the perspective of literary analysis. First, the names of Old Testament books that we find in our Bibles are not original to the canon. Some titles come from older Jewish traditions, some come from the Septuagint, the influential ancient Greek translation of the Old Testament, and some even come from much later Christian traditions. But the most important detail at this time has to do with 1 and 2 Samuel, 1 and 2 Kings and 1 and 2 Chronicles. These six books in our modern Bibles were originally just three — Samuel, Kings and Chronicles. In addition to this, many interpreters have pointed out that it is likely that Ezra and Nehemiah were also originally one book. As we read the Old Testament with a view to literary analysis we are concerned with observing the books of the Old Testament as they were originally given. So it is important to keep these qualifications in mind. Second, the order in which the books appear in the Old Testament has differed throughout history. The order of our modern Bibles depends heavily on the Septuagint, or Greek tradition. But in Jewish tradition, the last section of the Scriptures is different from ours. It is called the writings, and contains the books: Psalms, Proverbs, Job, Song of Solomon, Ruth, Lamentations, Ecclesiastes, Esther, Daniel, Ezra, Nehemiah and 1 and 2 Chronicles. In all events, despite these variations, it is still clear that the Old Testament canon is a collection of literary works, so that it is only appropriate that we maintain the integrity of these literary units as we analyze them. In contrast with thematic and historical analysis, treating the Old Testament as a picture by means of literary analysis is an attempt to pattern our understanding of the Old Testament after the patterns of the canon itself. In literary analysis we seek to arrange our theological assessments in ways that parallel the literary units in the canon. Now, of course, the only way completely to avoid rearranging what we find in the Old Testament is to leave the Old Testament canon precisely as it is: unanalyzed, un-interpreted and unapplied — even un-translated. So, some re-arrangement is unavoidable. Nevertheless, literary analysis seeks to minimize rearrangement, looking for the literary units and priorities of the Old Testament itself. When we approach the Old Testament canon as a picture, we seek to discern the distinct theological concerns of Genesis as Genesis, of Exodus as Exodus, of Leviticus as Leviticus, of Numbers as Numbers, of Deuteronomy as Deuteronomy, and so on. And in addition to this, we try to give weight to what is weighty, to make prominent in our interpretation what is prominent in these books. In addition to the fact that the Old Testament canon consists of literary rather than thematic or historical units, literary analysis is also justified by the fact that Old Testament books exhibit sophisticated literary qualities. If the books of the Old Testament were simple, colorless prose, literary analysis might not be so important. But the literary sophistication of Old Testament books calls for careful attention to their literary qualities. From common experience, we all know that some kinds of writings exhibit much more sophisticated style and intricate literary artistry than others. It would be strange, for instance, to find a shopping list written with the flare of a sonnet. A quick memo seldom receives the artistic attention that an elaborate novel receives. When we come upon simple writings, we do not usually need to pay much attention to their literary qualities to understand them adequately. But when we read a wonderful novel or a lovely poem, when we see their intricacies, we find that in order to appreciate them more fully, we must concentrate on their elaborate literary qualities. Discerning the sophisticated literary techniques of the writers helps us understand their texts. As it turns out, archaeologists have discovered a wide range of written materials from the world of the Old Testament. We have simple letters, lists, receipts and the like that do not exhibit much literary complexity. But archeologists have also discovered wonderful literary works from the Ancient Near East. The great cultures of biblical days had elaborate myths and legends, complex legal documents, intricate ritual texts. Many of us have heard of Enuma Elish , the Gilgamesh Epic , and the Baal Cycles . These were outstanding literary works composed with great artistry. But without a doubt, the books of the Old Testament are among the most elaborate literary works known from the ancient world. What drama could be more sophisticated than the book of Job? What narrative could be more intricately constructed than the book of Genesis? What poetry could be more memorable than the 23rd Psalm? By most standards, Old Testament books equal or surpass the literary artistry of the greatest literature of the greatest cultures of the ancient world. Unfortunately, Christians often overlook these literary qualities as they pursue thematic and historical interests. But in reality, it is the literary qualities of Old Testament books that enable their communicative power. The artistic qualities of Old Testament literature are the means by which Old Testament writers communicated their messages. We understand the communicative force — the intended influence — of Old Testament books only when we learn how to appreciate their literary qualities. And for this reason, literary analysis is vital when it comes to submitting ourselves to the authority of the Old Testament canon. In addition to employing literary analysis because the Old Testament comes in literary units and exhibits sophisticated literary qualities, we should pursue literary analysis of the Old Testament because of the variety of literature that it contains. The Old Testament canon is not a flat terrain with the same kind of writing appearing on every page. Instead, it is a varied landscape of mountains, rivers, lakes, fertile plains, deserts, and oceans. In other words, the books of the Old Testament represent a variety of genres or types of literature. Some Old Testament books are predominantly narrative, such as Genesis, Numbers, Joshua, Judges and Ruth. These books have only slight mixing of other genres such as genealogies, poems, and worship and social regulations. Then there are other books that are predominantly poetry: the Psalms, Job, and Amos, for instance. Still other books are highly stylized prose, such as Ecclesiastes and Malachi. Beyond this, speeches characterize the book of Deuteronomy. The list goes on and on. Realizing that there are various genres in the Old Testament is important because each genre has its own conventions, its own ways of communicating its influence. We must learn the ways each genre communicates the intentions of writers and apply that knowledge as we read the Old Testament. Law must be read as law, speeches must be read as speeches, stories as stories, poems as poems, aphorisms as aphorisms, visions as visions, genealogies as genealogies. To uncover the power of Old Testament passages to transform our lives, we must take into account what kind of literature Old Testament writers employed to communicate to their audiences, and genre considerations like these are at the very heart of literary analysis. In addition to the character of Scripture itself, literary analysis is based on the fact that biblical characters and writers sought the guidance of the Old Testament canon in this way as well. In fact, we may say that every time biblical writers interpreted Old Testament passages with careful attention to the main concerns of the human writer toward his audience, they were employing a significant measure of literary analysis. Moses permitted a man to write a certificate of divorce and send her away (Mark 10:4). It was because your hearts were hard that Moses wrote you this law (Mark 10:5). Jesus pointed out that Moses had permitted divorce as a concession to the hard hearts of the Israelites. For our purposes here, it is important to see that Jesus did not look exclusively at the text of Deuteronomy 24 and interpret its grammar or internal qualities alone. Instead, he explicitly viewed the passage in the light of what he knew about Moses as the author and the ancient Israelites as Moses' audience. He knew about the hardness of the Israelites' hearts and he knew the concern Moses had for Israel when he gave them his laws. The Pharisees had failed to account for proper literary concerns, especially Moses' intentions toward his hardened audience. Jesus, however, knew the importance of these factors, and rightly concluded that Moses' regulation was actually a concession, not an ideal. For it is written that Abraham had two sons, one by the slave woman and the other by the free woman. His son by the slave woman was born in the ordinary way; but his son by the free woman was born as the result of a promise. These things may be taken figuratively, for the women represent two covenants (Galatians 4:22-24). Now there is far more in these verses and their surrounding context than we can address at this time, but let's focus on the heart of Paul's interpretation here. In verse 24, Paul said that Abraham's interactions with Sarah and Isaac, and with Hagar and Ishmael, "may be taken figuratively" because they "represent two covenants." In other words, Paul understood that Abraham's interactions with these characters had grand theological implications for the ways people relate to living in covenant with God. To grasp these theological implications, let's look first at the events in Abraham's life. The Genesis record made it clear that Abraham faced a choice of two ways of relating to God: Sarah and Isaac on the one hand, and Hagar and Ishmael on the other. On one side, Abraham was faithful to God when he relied on God to keep his promise of a child through Sarah. This path of relying on God and his promise was difficult, but it was the way to God's blessing. On the other side, however, Abraham was unfaithful to God when he relied on his own efforts to have a child through Hagar, the Egyptian handmaiden. This path of relying on his own efforts resulted in the judgment of God against Abraham. With these basic patterns in mind, let's turn to the ways Moses used these patterns as he led the Israelites toward the Promised Land. Now, as Moses wrote about the life of Abraham, he was fully aware of the grand significance of Abraham's choices. In fact, he told these stories in Genesis so that they represented two ways of life that his Israelite readers faced in their day. On the one side, Moses called the Israelites to be faithful to God by relying on God to fulfill his promises of giving them possession of the Promised Land. Relying on God and his promise was difficult, but it was the way of blessing. On the other side, Moses called the Israelites not to rely on human efforts by turning back to Egypt like Abraham had turned to the Egyptian handmaiden Hagar. Turning back would result in the judgment of God against Israel. Following this direction of Moses' original meaning, Paul applied these stories to the choices facing the churches in Galatia. The Galatians had to make a choice between the true gospel from Paul and a false gospel that had come to their churches from representatives of Jerusalem. The true gospel was that salvation comes purely by trusting in the promises of God in Christ. The false gospel turned people away from faith in the promises of God to human effort of obedience to the law as the way of salvation. And as Paul said in Galatians those who follow the true gospel of faith in God's promises are children of Sarah and heirs of the promise, but those who follow the false gospel are children of Hagar and not heirs of the gift of salvation. Paul made it clear that the true gospel of faith in God's promises leads to blessings and the false gospel of obedience to the law leads only to judgment. It was Paul's concern with literary analysis, his attention to the ways Moses used literary figures in the stories of Genesis, that led him to apply Genesis so poignantly to the churches of Galatia. Now that we have seen the basis of treating the Old Testament as a literary portrait, we should turn our attention to the focus of literary analysis. What is to be our concern in this approach to the Old Testament canon? On what should we concentrate? There are many ways we could describe the concerns of literary analysis, but for our purposes it helps to think in terms of a threefold focus. First, we are concerned with the writer of a passage; second, we focus on the original audience of a passage; and third, we are interested in the actual document or text we are studying. Let's think first of the importance of considering the writers of the Old Testament. Now, without a doubt God is the ultimate author of the entire Old Testament. He inspired and superintended the writing of the entire Old Testament canon. But as we have seen in another lesson, this inspiration was organic. God used the backgrounds, thoughts, feelings, and intentions of human writers to create the books of the canon, and we should be concerned with these human elements as we read the Old Testament. As we consider a focus on writers, we should look in two directions: on the one hand, we should be aware of a number of dangers and on the other hand we should see a number of benefits. Many dangers come from a focus on human writers of the Old Testament when we become involved in speculation. In the past, many interpreters have focused on writers in ways that produce tangled webs of psychological and sociological speculations. They have done this, in part, by pressing issues like the precise identification of the writer, the specific circumstances he faced, and the details of his theological motivations. As important as these kinds of issues may be, if we press for answers beyond what we know, we can make our interpretations depend on flimsy speculations. This kind of overemphasis on the writer may be dubbed, "the intentional fallacy," giving too much weight to our reconstructions of a writer's intentions. But on the other hand, there is great benefit in focusing on writers if we are careful and responsible. As we will see in later lessons, we may not know as much about biblical writers as we would like to know, but we can still know much that can help us understand their writings. We can have varying degrees of general knowledge about their identities, about their broad circumstances, and about their basic theological motives. Take, for example, the writer of Chronicles, or the Chronicler as he is often called. Now, we do not know with certainty who this man was. We do not know his name or his precise social standing, or exactly when he lived or wrote his book. We do not know very much about his psychological tendencies or about his personal strengths and weaknesses. So, to rely heavily on these sorts of considerations as we interpret his book runs the risk of building on wrong assumptions. Nevertheless, we can derive valuable information about him from the Old Testament itself. For example, we know that the Chronicler lived and wrote sometime after the exile, when a number of Israelites had returned to the Promised Land. This is certain because the genealogies of 1 Chronicles 9:1-44 list those who returned, and the last verse of his book, 2 Chronicles 36:23, mentions the command of Cyrus the Persian that the Jews should return to their land. We also know that he was among the educated elite of Israel. He quoted from large sections of the books of Samuel and Kings, and referred to other biblical books as well. And more than this, in passages like 1 Chronicles 27:24 the Chronicler mentioned the content of royal annals, and in verses like 2 Chronicles 9:29 he referred to collections of prophetic oracles that do not even appear in the Old Testament. Beyond this, by comparing his books with Samuel and Kings, we know that the Chronicler had a number of very important theological commitments. He was very committed to the rule of David's house and the purity of the temple in Jerusalem. He repeatedly referred to the law of Moses as the guide for Israel's faith and life. And by noticing how he piled up examples of immediate consequences for sin and obedience we know that the Chronicler was very interested in the way God blessed and cursed his people within a generation of significant fidelity and infidelity. There are a number of other things we could say about the Chronicler's beliefs and hopes, but the main point is this: we have sufficient knowledge about the Chronicler to analyze the way he used literary techniques to influence his original readers. And we have even more information about other biblical writers, so that regularly focusing on the writer in our interpretations can be quite beneficial. Now, in addition to focusing on the writer, responsible literary analysis of the Old Testament also considers the original audience. What was their situation? How were they to be influenced by the Scriptures they received? Once again, just as there are dangers and benefits as we consider the writers of Old Testament books, we also need to be aware of the dangers and benefits of focusing on the original audiences. On the one hand, just as some forms of literary analysis speculate too much regarding the writers of Scripture, others depend far too heavily on detailed knowledge of the audience. They speculate as to the precise identification of the audience. They reconstruct specific details of the audiences' circumstances. They imagine the psychological conditions of the audiences. They go too far imagining their strengths and weaknesses. When these kinds of positions are too central in interpretation, we once again run the risk of psychological and sociological speculation, and for this reason, an overemphasis on the audience may be called "the affective fallacy." For instance, in the case of Chronicles, we don't really know if Chronicler just wrote for a select group of people, such as the priests or the family of David, or for the general populace. We don't know how many people were resistant or compliant. We don't know for sure if they lived before, during, or after the times of Ezra and Nehemiah. Without a doubt, knowing these things might shed additional light on our interpretations. But at this time we have no way to be certain of such things, and our interpretation is more responsible when we do not speculate regarding them. At the same time, however, there are many benefits we can derive from considering the audience because we usually know lots of helpful general information. In very general terms, we know that the intended audiences could understand, if not read, ancient Hebrew. We often know their general location. And we frequently know some of the major events that they had experienced. And we know that as with most groups of people, some were faithful and others were unfaithful to their covenant responsibilities before God. In the case of Chronicles, we still know much about the original audience. The fact that the genealogies in 1 Chronicles 9 end with a list of people who had returned to the land indicates that the Chronicler wrote in the Promised Land for people who lived there with him. We can also learn a lot about their general social conditions from books like Haggai, Zechariah, Malachi, Ezra and Nehemiah. These were difficult times. Contrary to the prophets' hopes, only a few Israelites had returned to the land. Temple worship was weak at best, and the throne of David was not re-established. The nation faced economic hardships. And Israel suffered repeated threats of conflict and war. We can know these kinds of things about the condition of the audience with great clarity and without involving ourselves in speculation. What we know about the original audience helps us gain a deeper appreciation for the purpose and original meaning of Chronicles. And as a result, interpretations of every particular passage in Chronicles should proceed in the light of what we know about the original audience. Now that we have touched on the importance of considering what we know about the writer and audience, we should turn to the third and primary focus of a literary analysis of the Old Testament — a concern with the document itself. As we will use the word "document," it refers to any portion of the Old Testament that we may have in view, whether it be just a sentence or two, a verse or two, a section of verses, a chapter, a section of a book, a whole book, a corpus or group of books, or even the entire Old Testament canon. In all events, our focus on the document is central to literary analysis. Unfortunately, in recent decades, a number of interpreters have urged that the document itself is all we need for interpretation. In an attempt to avoid the uncertainties entailed in considering the writer and audience, these scholars have argued that we must downplay the writer and audience. In reality, this is not a safe direction to follow because the same document, whether biblical or not, can mean very different things depending on who wrote it and for whom it was written. When interpreters try to focus exclusively on the document and ignore the writer and audience, they fall into a mistake that we may call "the graphic fallacy," placing too much hope in the document by itself. In order to illustrate the importance of looking carefully at the document in the context of the writer and the audience, we will examine the reign of Manasseh in 2 Chronicles 33:1-20. When we study this passage, we have a great advantage of possessing a parallel account of Manasseh in 2 Kings 21:1-18. In fact, the writer of Chronicles copied, changed, omitted and added to 2 Kings 21 in ways that are very important for literary analysis. Let's start by looking at the account of 2 Kings. 2 Kings 21 divides into five symmetrical parts: first, verse 1, the opening of Manasseh's reign; second, verses 2-9, Manasseh's sin of idolatry; third, verses 10-15, the prophetic condemnation of Manasseh; fourth, verse 16, Manasseh's additional sin of violence; and fifth, verses 17-18, the closure of Manasseh's reign. As this outline suggests, in 2 Kings 21, Manasseh is characterized as evil from beginning to end. He is introduced as a great sinner. The second portion of the story elaborates on his idolatry — he defiled the temple with idols and led the people to do more evil than the Canaanites. The third part of the narrative amounts to a horrifying condemnation of Manasseh by the Lord's prophets. According to these verses, Manasseh's sins resulted in Jerusalem's destruction and the exile of its people. The fourth portion of the narrative mentions that Manasseh also filled the streets of Jerusalem with innocent blood. Then the final portion simply reports that Manasseh died and was buried. In 2 Kings 21, there is not one redeeming quality in Manasseh's life. Now let's turn to the record of Manasseh's reign in 2 Chronicles 33. This account does not contradict 2 Kings 21, but it is very different. 2 Chronicles 33:1-20 also divides into 5 main parts: first, verse 1, the opening of Manasseh's reign which is largely copied directly from 2 Kings; second, verses 2-9, Manasseh's idolatries are recounted with only slight differences from 2 Kings 21:1-9. So far, the Chronicler's account closely resembles that of 2 Kings. In both records Manasseh is presented as a terrible sinner. But the third, fourth and fifth sections of the account of 2 Chronicles 33 differ dramatically from 2 Kings. In the third section, verses 10-13 the Chronicler chose not to include the prophecy in 2 Kings that Judah would be exiled in the future. Instead, the Chronicler stated that Manasseh himself was exiled to Babylon in his own lifetime. While there, Manasseh repented of his sins and received forgiveness. Then, in the fourth section, verses 14-17, instead of mentioning Manasseh's violence, the Chronicler reported that Manasseh returned to Jerusalem, rebuilt the city, and restored proper worship of God at the temple. And finally, in 2 Chronicles 33:18-20, the closing of Manasseh's reign expands on 2 Kings by including another reference to Manasseh's prayer of repentance. By comparison with 2 Kings, the Chronicler's record is much more positive. Both accounts report Manasseh's terrible sins; 2 Kings reports the prophets' condemnation of Manasseh as well as Manasseh's violence against the people of Jerusalem. But the Chronicler omits these portions of the story in 2 Kings. Instead, the Chronicler added that Manasseh was exiled, repented and was forgiven. And he also added that Manasseh returned to Jerusalem, and restored the city and temple. And finally, although both accounts end with Manasseh's death, 2 Chronicles adds a reminder of Manasseh's repentance. So, in a word, 2 Kings presents Manasseh as a consistent sinner, but 2 Chronicles presents him as a repentant sinner. Considering these differences between the parallel accounts in 2 Kings and 2 Chronicles, we must ask another literary question. Why are these accounts so different? Why do they offer such different outlooks on Manasseh's life? In a word, the differences can be explained only by the fact that Kings and Chronicles were written by different people and for different audiences. Each writer had his own purposes for giving an account of Manasseh's reign. As we will learn in a later lesson, the writer of Kings wrote primarily to explain to the exiles in Babylon why the destruction of Jerusalem had occurred, and why they had been driven from the Land of Promise. His answer was that Manasseh's sins had brought these curses upon the nation. But as we have seen, the Chronicler's situation was very different. He wrote his history after the exile in an attempt to motivate the struggling restored community to move forward in faithful service to God. For this reason, the Chronicler omitted and added true things about Manasseh that fit with his purposes. He did this by bringing to light details from Manasseh's life that paralleled details in the lives of his own Israelite readers. Manasseh had sinned terribly, and they had done the same. Manasseh had been exiled to Babylon, and they had been too. Manasseh had repented and been forgiven and so had they. Most importantly, once Manasseh had returned, he had rebuilt the city of Jerusalem and had restored proper worship. And this was the very challenge that the Chronicler's audience faced in his day. Would they follow Manasseh's example by rebuilding and restoring the proper worship of God in Jerusalem? The Chronicler's main point was this, if the king who had caused Judah's exile also rebuilt and restored the kingdom when he returned to the land, surely the Chronicler's own audience should do the same. This brief literary analysis of Manasseh's reign in 2 Chronicles 33 illustrates the value of appreciating how Old Testament literature communicates its authoritative message. As we consider the writers, the audiences and the literary qualities of Old Testament documents, we can discern the main purposes for which the various parts of the Old Testament canon were written. And knowing these purposes will help us understand the Old Testament's authoritative message not only for its original audience, but also for us today. In this lesson we have explored the Old Testament as a collection of authoritative books, a canon designed to guide the people of God in the situations they faced. We have seen how God's people have submitted to the authority of the Old Testament canon in three main ways. In our exploration of the Old Testament as a mirror through thematic analysis, we have learned the value of looking at all of the themes in Old Testament passages, including minor themes, for answers to the questions that arise in our own lives. Through using the Bible as a window, in historical analysis, we have seen the significance of the historical events that the Old Testament reports. And by looking at the Old Testament as a picture through literary analysis, we have learned how to discern the main purposes or influences Old Testament passages were designed to have over God's people. As we continue this survey of the Old Testament canon in future lessons, we will return to these three approaches time and again. Exploring the Old Testament from these three vantage points will not only help us understand how the Old Testament canon led God's people in the past. It will help us see the many ways it is our authoritative guide even today.